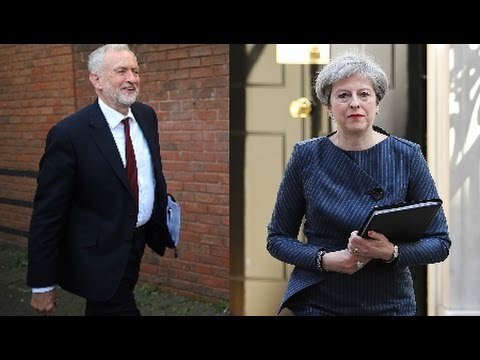 May's decision to call a snap election is an opportunistic move, she also has an eye on the electoral arenas in France and Germany says Prof. Leo Panitch co-editor of the 2016 Socialist Register titled "The Politics of the Right"
THERESA MAY:	I have just chaired a meeting of the Cabinet, where we agreed that the government should call a general election, to be held on the 8th of June. Britain is leaving the European Union, and there can be no turning back. And as we look to the future, the government has the right plan to negotiating our new relationship with Europe. We want a deep and special partnership, between a strong and successful European Union, and a United Kingdom, that is free to chart its own way in the world. Our opponents believe, because the government’s majority is so small, that our resolve will weaken and that they can force us to change course. They are wrong. They underestimate our determination to get the job done. And I’m not prepared to let them endanger the security of millions of working people across the country. Because what they are doing jeopardizes the work we must do to prepare for Brexit at home, and it weakens the government’s negotiating position in Europe. SHARMINI PERIES:	Labour Party leader, Jeremy Corbyn welcomed the idea, and the decision to compete with her. Here’s what he had to say. JEREMY CORBYN:	I welcome the opportunity for us to put the case of the people of Britain, to stand up against this government and its failed economic agenda, which has left our NHS in problems, which has left our schools under-funded, which left so many people uncertain. We want to put a case out there to the people of Britain, of a society that cares for all, an economy that works for all, and a Brexit that works for all. Leo, thanks so much for joining us today. SHARMINI PERIES:	So Leo, Theresa May made her case for calling a snap election, by saying that she couldn’t execute on the people’s decision as far as Brexit was concerned. Primarily because Westminster is so divided, she’s not getting the support she needs in order to carry out the exit negotiations with the European Union. What do you think is her motivation for calling for a snap election at this time? LEO PANITCH:	Well, it’s a reversal on what she previously said, and it’s opportunistic. She’s bearing in mind that Gordon Brown, when he replaced Tony Blair, also without an election, as she replaced Cameron without an election, he held back from calling one, even though he had a high degree of popularity in the months after he became Prime Minister. Much higher than Blair had in the polls, but he dithered and waited. And in waiting, the result was that the government lost its popularity and lost the election. So, I think she’s looking at that. She’s looking at polls that are showing the Tories are upwards of some 17 to 20% ahead of the Labour Party in the polls. She may be looking over at Europe, because with the rise this last couple of weeks of the Mélenchon candidacy for the presidency, with the sizable support that he is getting. And the prospect, in fact, that he may last into the second round to contend Le Pen. That may indicate to her that if she waits too long, the resentment in Britain against austerity, and indeed against what a lot of what the European Union does represent, in a negative sense, for working people. Even if it represents something positive, in terms of the movement of labor and human rights, she may fear that she may become a cropper in the long run. On top of that, the Social Democrats are doing better in Germany. And she may have her eye on that as well. So, it’s fundamentally opportunistic, although of course she’s also looking to getting a large Tory majority. One, in fact, that is backed by very right wing Tory MPs, would allow her to try to get the kind of Brexit which is entirely focused on free capital mobility. On protecting the City of London, but is not focused on retaining, within British Law, the positive elements that were adopted into British law, in terms of rights of refugees, labor mobility, labor rights, human rights, and so on. SHARMINI PERIES:	Now Leo, the Labour Party might have been caught off guard, because in theory it was not expected ’til 2020, in terms of having to compete in an election for a Prime Minister here. Yet, Jeremy Corbyn was very gracious, and he welcomed the opportunity. How do you think he will fare in this election then? LEO PANITCH:	Well, according to the opinion polls he’ll fare poorly, and that’s why she’s going now. That said, in the last few weeks he has released a radical policy platform — by no means revolutionary — but radical, in the sense of being highly critical of austerity, exposing further cuts to the NHS, to the National Health Service, that is. Promising a 10-pound minimum wage, and free school meals for children, all of which will be popular with labor’s constituency, even that constituency that voted for Brexit. So, this was unleashed with a view to the local elections. The municipal elections take place this May. This will be the grounds upon which they will run. Now on June 8th, and, you know, it may well be that if Corbyn saw that he was going to do poorly in the local elections, he might think that galvanizing Labour voters, as a much higher turnout, around the national election, will give labor a better chance with a higher turnout of regular Labour voters. And if he also felt that he was not making the breakthrough that another leftwing MP might make, because Corbyn is not the most charismatic of figures, and isn’t at all power hungry. He may feel, “Well, maybe it’s better to clear the deck, and have someone else on the left succeed me after this election,” in order to continue the process of trying to turn the Labour Party into something it has not been for a long time. Which is a mobilizing, educative, progressive force in British society. SHARMINI PERIES:	Now, Leo is there any chance that Brexit plans itself might get reversed in this process? Because we know that many people didn’t turn out for the Brexit referendum. So, you mean that it wasn’t going to succeed, but might be motivated to turn out this time around if a reversal was possible? LEO PANITCH:	I think that’s unlikely. I think the referendum actually had a higher turnout than recent British elections, if I’m not mistaken. But in any case, I don’t think there’ll be that type of a swing. Labour itself, remember, accepted the referendum’s outcome, while saying that they did not want the type of Brexit that harmed working people, that stopped the rights of refugees, that allowed for capital mobility without labor mobility, etcetera. I think they are honorable in doing that. But they did not come out against the outcome of the referendum. Now that has disappointed a lot of people, especially in London, who are internationalists, etcetera. And it’s conceivable that a good number of Labour voters who voted to remain, could in London, vote for the Liberal Democrats, or possibly the Greens. I don’t think there’ll be enough of that to take away very many Labour seats, but you never know. SHARMINI PERIES:	Leo, now put this in the context of what else is going on in Europe. We know that in France there’s also a presidential election underway in the next few weeks, and there are other shifts coming about as well. Give us the context here. LEO PANITCH:	Yeah, I think that this is really, really significant. What is happening now, by virtue of this opportunistic move by May, is that there’s going to be elections between next week and the fall, in September, in the three largest and most powerful European countries: France, Britain, and then Germany in the fall. May, may have had an eye to what’s been happening in France in recent weeks, where the de-legitimation of the mainstream center left, and center right parties, is so evident. Those parties who embedded themselves in the neo-liberal state, and the neo-liberal process of globalization that was ushered in, not only through the American state, but through the European Union. And she may have had an eye to the growth in popularity of, not only Le Pen on the right, but especially Mélechon on the left. And she also may have had an eye to the fact that the Social Democrats are doing much better in Germany in the polls, as against the conservatives, the Christian Democrats. So, she may have figured, “I better move while the iron is hot.” And I think one needs in that sense to keep one’s eye open, just as with Trump and Sanders in the American election. The de-legitimation of those parties that associated themselves with neo-liberalism, which in Britain means both, the Labour Party before Corbyn, as well as the Tories, may play itself out in interesting ways even in this British election. The vote for Brexit was partly on the part of traditional Labor supporters, a vote against neo-liberalism. Although it was, of course, mixed up with the strong appeal of xenophobic, rightwing elements, to Labour’s class interest. But, it’s going to be a very, very interesting spring and summer that we are going to have, and it’s going to tell us a lot about what the balance of forces is, in Europe this year. SHARMINI PERIES:	Leo, the Labour Party could also use this opportunity, of course, to build itself, like in the United States and our revolution attached to Bernie Sanders, there’s a similar movement in the U.K. called Momentum, who is doing some very local organizing and building a movement behind Corbyn, where is that at? And is this an opportunity for it to generate itself? LEO PANITCH:	Well, they would hope so. The difficulty with election campaigns is they draw people into the immediate short-term task of getting out the vote. When what’s needed to transform a party like the Labour Party, heaven knows, like the Democratic Party in the United States, is a much more fundamental change in the branches of the party. Where they are not only electoral machines, not only get out the vote machines, which people are cynical about, but are actually active in centers of working class life. Relating to working class peoples’ experiences, and making themselves centers of education and support, on a day-to-day basis. The short-term affect of the election will be to divert attention from what Momentum hopes to do in that respect. But in the longer term, even if Labour does poorly in this election, and comes out with fewer Members of Parliament than it now has, it’s likely to retain more of the leftwing Members of Parliament, who have a stronger base in the party, in the working class. And, therefore, coming out of this election, even with fewer MPs, the chances would be greater for renewing the party on a long-term basis. And I think if we’re honest with ourselves — although it’s very important to stop this new right — it’s also very important not to have a short-term perspective. We need to create the type of political institutions, which go beyond the terrible alternatives we’ve been offered by the Tweedledee and Tweedledum parties within neo-liberalism. And a longer-term perspective, even with the smaller Labour Party’s representation in Parliament, may be what it takes. And if that’s the case, one would hope Momentum would be a strong force for doing that. SHARMINI PERIES:	Now certainly we’ll be following this election and which is just around the corner, compared to American elections, where there is a two-year lead-up. I thank you so much for joining us, and hope you can join us for ongoing analysis, as things unfold over the next two months. LEO PANITCH:	Always good to talk to you, Sharmini. Bye.